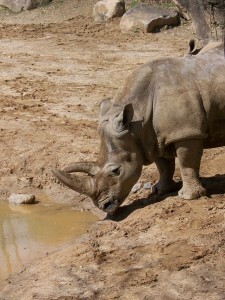 Last June I presented my first look at Photoshop CS5, and I was very impressed with the new features. Back then I felt it was definitely worth the upgrade. After many more weeks of using the software it is time to reevaluate and see if my opinion is the same or has changed. For part one of the review I am going to cover Content Aware Fill and Puppet Warp. In June I thought this was the key selling point to Photoshop CS5 and I still do. The tool basically lets you remove part of a picture and fill it based on the surrounding area from the picture. It is a great tool and every time I use it, and it works, I am amazed. I say “and it works” because it isn’t 100% reliable. The tool works with any photo (black and white, color, CMYK, RGB, etc). However, it really needs the surrounding area to be very simple or so complex that it does not matter what is is filled with. Abstract areas work great. Trying to take a soccer player off a field with fans and a busy background behind him may not work so good. Many times you can go in and redo the fill several times to make the results better. 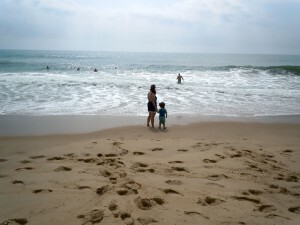 Here’s an image I took of my wife and son at the beach. 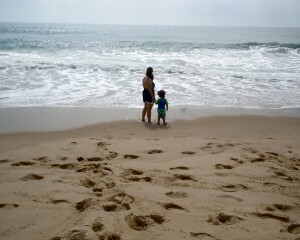 I wanted to take the people out of the ocean so it was just the two of them. In this instance the tool worked perfectly. Overall it works great, but it isn’t perfect. It depends on the picture. My main complaint is that it changes the way the delete key works in the program. Instead of a keyboard command or another tool in the toolbar, this feature works with the “Delete” key. Instead of just deleting something when you press the “Delete” key , you now have to choose from using the content aware fill, foreground color, background color, and more. I wish it worked differently and I had the delete key back to quickly delete a selection. Puppet warp allows you to take part of an object and add bones to it and bend that object along the joints. If you have an arm outstretched and you want to bend it, this tool will allow you to do that. It works great with Content Aware Fill because you use the fill tool to fix the space left behind from what you have moved, if you need to. To use the tool you have to select what you want to bend and apply the bones. The great thing about this tool is that it is incredibly easy to use. Adding bonces is as simple as clicking where you want to bend the image. However, with that said, to get this tool to work best requires patience. The more bones you add to the item moving the better, and that means time. If you don’t use enough bones your warping will be distorted, especially with a complex image. As with the fill tool, it is great when it works, but it is cool and a nice tool in your Photoshop arsenal. The tool also relies on good selecting. You don’t want to have too little or too much selected when using this tool. Luckily, the selection tools have been greatly improved in Photoshop, but that will be covered next time. Overall, these new tools in Photoshop CS5 are great new additions to Photoshop. The make image manipulation that much easier and faster. Any Photoshop user is going to want to have these tools. However, the real question is do these tools and the others make it worth the money to upgrade or buy for the first time? Stay tuned for Part 2 of my evaluation of the other new features in Photoshop and my conclusion. I love CS5. Sometimes using content aware fill requires touching up afterwards, but it is still pretty useful in most situations. I’ve found that sometimes removing stuff in little sections works well. I’m supposed to be finishing a review on the HDRI functions of CS5 and the O’Reilly webcast on the topic. I have some thoughts about what CS5’s HDR tools work best for that I’ll put in the review. 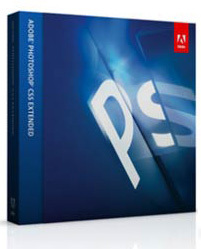 Pingback: Adobe Photoshop CS5 Review: Two Big Things!